Heavy bleeding is one of the symptoms of having certain types of fibroids. The bleeding can be so severe that it depletes the body of iron leading to anemia which can be life threatening if not treated promptly. If you suffer from heavy bleeding associated with fibroids, there are many ways that are effective for the natural treatment of uterine fibroids including the use of herbs. There are a number of herbs that can be used to treat this symptom including yarrow, red raspberry, shepherd’s purse, lady’s mantle, cranesbill, etc. If you cannot get your hands on these herbs, you can easily reach into your kitchen cabinet and use cinnamon which is also another of the effective herbs used to stop heavy bleeding with fibroids. Why Do Fibroids Cause Bleeding? About 30 percent of women who have uterine fibroids will experience heavy bleeding or irregular bleeding. A lot of this heavy bleeding is blamed on submucosal (submucous) fibroids that grow just under the uterus lining. This is one of the less common types of fibroids but since they are so close to the lining of the uterus (endometrium or mucosa), they affect the blood vessels in the uterine lining causing prolonged and/or heavy bleeding. Submucosal fibroids lead to heavy bleeding when they prevent the uterus from being able to close the blood vessels around the uterus due to the location of this type of tumor. Intramural fibroid tumors that grow within the muscular walls of the uterus may also cause heavy bleeding as they increase in number or size. This type of fibroid tumor is the most common and usually does not produce any symptoms or cause any problems unless as mentioned previously, they increase in size and number. Heavy bleeding from intramural fibroids results when these tumors within the uterine wall interfere with the normal rhythmic uterine contractions and prevent the uterus from closing the blood vessels in the uterine lining as is normal when these tumors are not present in the uterine wall or when the fibroids are harmless and symptom free which occurs only when they are located away from the uterine cavity. While submucosal and intramural fibroids are commonly to blame for causing heavy bleeding, other types of fibroids may also cause excessive blood loss. The need to use two tampons or two pads at the same time or saturating a pad or tampon within an hour. Flooding leading to accidents resulting in embarrassing stained clothing. Needing to wear adult diapers in order to comfortably contain the excessive blood flow. Needing to get up at night frequently in order to change the pad or tampon while also still having accidents resulting in stained bedclothes. Needing to also change your social schedule as well as work commitments due to this heavy menstrual cycle. In addition, you will experience heavy blood loss if your menstrual cycle lasts for at least a week and/or occurs more frequently than every 21 days and if you bleed between periods. If you are experiencing any of the above or other irregularities signifying heavy blood loss, this could create a state of anemia since you are losing too many red blood cells with the heavy blood loss. This condition could become fatal if the excessive bleeding is not controlled. Heavy blood loss can also lead to dizziness and weakness. Heavy and prolonged bleeding is one of the main reasons that hysterectomies are performed each year. Before taking such a drastic step, it is important to remember that heavy and prolonged bleeding can be controlled naturally including with the use of certain herbs such as cinnamon. An anemic state results because heavy blood loss leads to the body not having enough iron due to the loss of iron that is normally carried in red blood cells. The heavy bleeding is not usually sudden. It will usually build gradually over several months. When in an anemic state, there will be less oxygen being carried by the red blood cells to vital organs. With less oxygen reaching vital organs such as the brain, you may experience fatigue, shortening of breath, ringing in the ears, light headedness, headaches, dizziness, etc. At worst, heart failure or heart attack may occur. Pain, due to the antimicrobial properties found in cinnamon through the action of eugenol which is a natural anesthetic oil found in this herb. To treat infections which is one of the reasons that cinnamon is commonly included in toothpaste and dental floss. Cinnamon which contains very powerful antiseptics can kill various disease causing bacteria, fungi as well as viruses. High cholesterol can be reduced by consuming about a teaspoon of cinnamon a day. Cinnamon has been found to be a great help in reducing blood sugar which is great news for those with diabetes. Some studies have shown that cinnamon can reduce blood pressure so if you suffer from high blood pressure, it cannot hurt to try cinnamon. Cinnamon can also help if you have any digestive issues such as bloating, indigestion, gas, etc. Many herbalists endorse cinnamon for various uterine problems including heavy bleeding. They believe that cinnamon works on the uterine muscle fibers by calming the uterus and its astringent properties help to close the blood vessels and prevent heavy bleeding. While there are many other herbs that may be considered more effective for heavy bleeding that were previously mentioned such as shepherd’s purse, yarrow and red raspberry, cinnamon works nearly as well if you do not have access to the other herbs because of cinnamon’s astringent (blood controlling) properties. Some herbalists do not agree that cinnamon can calm the uterus. They believe that it can cause uterine contractions so pregnant women should only consume cinnamon when it is as part of the normal preparation of various savory dishes. While powdered cinnamon is generally safe, cinnamon oil can cause vomiting, nausea, kidney damage, etc, when taken internally. Avoid ingesting cinnamon oil for this reason. 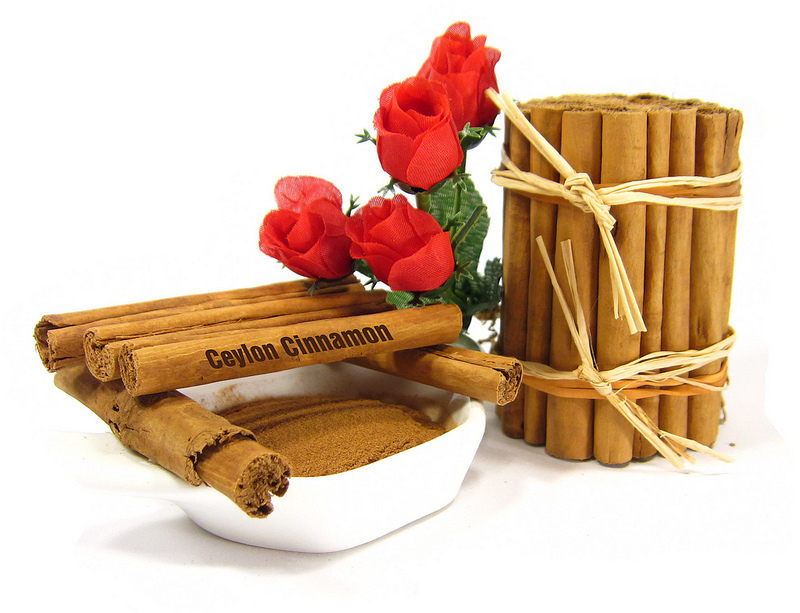 Cinnamon oil can also cause burning or redness when applied to the skin. Cinnamon can also cause an allergic reaction in some people. If symptoms persist for longer than two weeks or worsen, seek a health care professional immediately. As mentioned previously, while cinnamon is also called Cassia, Ceylon cinnamon and Saigon cinnamon, it’s generally recommended for natural treatment that you use Ceylon (Sri Lankan) cinnamon which is considered “real” cinnamon compared to the other types which can increase the risk of developing liver issues when taken on a prolonged basis. When using cinnamon to prevent bleeding from uterine fibroids, make a warm, spicy and sweet concoction using 3 teaspoons of cinnamon in a cup of hot water. Steep for about 10 minutes and drink. You may strain this concoction before drinking if you wish. Consume this infusion every 30 minutes until the bleeding normalizes. If symptoms worsen, stop use. Cinnamon is definitely one of the best herbs to deal with symptoms of uterine fibroids such as heavy bleeding. Give this a try if you are trying to normalize menstrual bleeding. For the best source for organic cinnamon, click here. While experiencing heavy bleeding from fibroids can be frightening, do remember that there are many effective ways for the natural treatment of fibroids including with the use of various herbs to stop heaving bleeding with fibroids including using cinnamon. You may also want to try MensReduce which is a tincture that contains various herbals remedies that can normalize the menstrual cycle. For a complete holistic program to address the root cause of fibroids, click here. Prev Are Hair Relaxers To Blame For Uterine Fibroids? Next Could Vitamin D Be a Cure For Uterine Fibroids? Thanks for sharing these herbs. Didn’t know that using cinnamon can cure bleeding.